If you glance at the title of this recipe and assume it is a run of the mill "throw a jar of spaghetti sauce together with mozzarella cheese and bake it," casserole, you are sorely mistaken. This is, dare I say, gourmet Mac and Cheese. A delicious white cheese sauce coats the pasta and a sprinkling of breadcrumbs and cheese is used to top this glorious dish. I did make a few changes, but I do not think they changed the overall flavors of the dish. My changes: I used Penne instead of lasagna noodles. I omitted the cheddar, used half the amount of pepperoni. Instead of adding 2 cups of Parmesan to the sauce, I added 1 cup of a Parmesan, Asiago & Romano blend, and 1 cup of mozzarella. Next time around I think I will make more sauce and use less pepperoni. 1. Fill a large pot with water and bring to a boil over high heat. Add 1 tablespoon salt carefully add the lasagna noodles. Return to a boil, reduce the heat to a low boil and cook for about 5 minutes, or until pasta is very al dente (slightly undercooked). Drain in a colander, rinse slightly and drizzle with olive oil to prevent sticking. 2. In a heavy, medium saucepan melt 4 tablespoons of the butter over low heat. Add the garlic and then the flour and stir to combine. Cook, stirring constantly, for 3 minutes. Increase the heat to medium and whisk in the half-and-half little by little. Cook until thickened, about 4 to 5 minutes, stirring frequently. Remove from the heat; add 2 cups of the grated Parmesan. Season with the salt, pepper and stir until cheese is melted and sauce is smooth. Cover and set aside. 4. In a large bowl combine 1/4 cup Parmesan, Cheddar, and mozzarella. Toss to combine. 5. Grease a 3-quart baking dish or casserole with 1 tablespoon of butter. Spread a ladle full of sauce on the bottom of the pan. Cover the sauce with a single layer of cooked lasagna noodles. Spread another ladle full of sauce on top of noodles. Sprinkle with 1/3 of the mozzarella cheese mixture. Top with 1/3 of the sliced pepperoni. Repeat with remaining ingredients for 2 more layers. 6. Sprinkle 1/2 cup bread crumbs onto top of lasagna and top with remaining grated Parmesan, 1/4 cup. Bake, uncovered, for 40 to 45 minutes or until the lasagna is bubbly and hot and the top is golden brown. Remove from the oven and allow to sit for 5 minutes before serving. This sounds fantastic! Can't wait to try it - thanks for the recipe. Mmmm this looks amazing! Definitely starred! 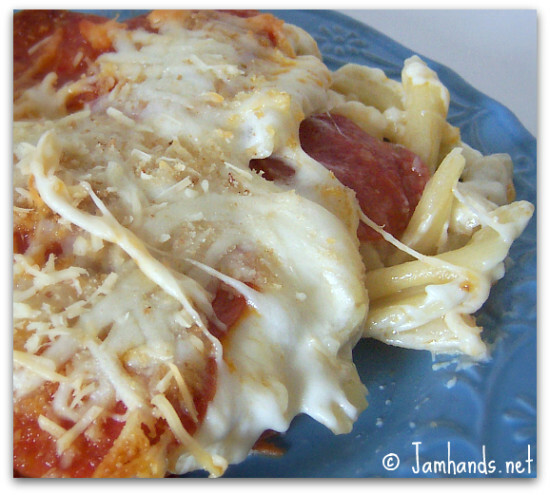 Pepperoni is a great twist to this yummy mac and cheese! Delicious! I made this tonight... mine didn't look as appetizing as yours, but it certainly was fabulous tasting! I think I ate three days of calories in one meal, not that I actually would want to know the nutritional stats on this dish. Better off not knowing some things. Ummmm, yes please! This sounds so delicious, my husband would just die over this! here on my blog. Thank you for sharing the recipe. It was really good, and made a ton. Has anyone tried this with turkey pepperoni? I'm wondering if it would cut down on the oiliness, especially in the leftovers.